What's the best way to reach out and touch someone? 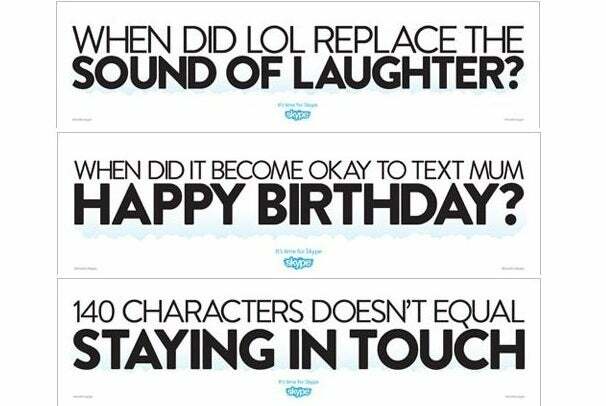 According to a new Skype ad campaign in the U.K., not through Facebook posts, Twitter tweets, or hastily typed text messages, but through voice and video calls. Skype this week launched a $12 million campaign at British transportation hubs, such as Heathrow Airport, that pokes fun at social media services that eschew voice in favor of less direct modes of communication, Adweek reports. One ad suggests that Skype is "Your One-Way Ticket Back To Humanity," while another reminds you that "Humans Were Made To Look Listen And Feel." OK, we get it: Voice and video establish a deeper, more personal connection between members of the human race. Facebook and Twitter? Meh. And U.S. social media savants, you're not off the hook. Skype's ad campaign will expand to this side of the pond in the next few months, reports Adweek. Microsoft bought Skype for $8.5 billion last year. Skype in February launched a beta voice and video calling app for Microsoft's Windows Phone mobile OS. Feeling guilty? Mum's sitting by her dusty Skype phone, waiting for your call.